Horsetail (Equisetum Arvense) other names: Asprêle, Bottle Brush, Cavalinha, Coda Cavallina, Cola de Caballo, Common Horsetail, Corn Horsetail, Dutch Rushes, Equiseti Herba, Equisetum, Equisetum arvense, Equisetum hyemale, Equisetum telmateia, Field Horsetail, Herbe à Récurer, Horse Herb, Horsetail Grass, Horsetail Rush, Horse Willow, Paddock-Pipes, Pewterwort, Prele, Prêle, Prêle Commune, Prêle des Champs, Queue-de-Chat, Queue-de-Cheval, Queue-de-Rat, Queue-de-Renard, Scouring Rush, Souring Rush, Shave Grass, Shavegrass, Spring Horsetail, Toadpipe. Horsetail is a well known herb; horsetail is a perennial herb growing in moist loamy or sandy soil found in much of the North American continent, as well as in similar climates in Europe and Asia. The morphology of the horsetail herb is very strange and the plant has a creeping, or string like rootstock which gives it its name. The roots at the nodes are turned into numerous hollow stems of two kinds. Horsetail begins growth in two stages, initial growth of the plant is through a fertile and flesh colored stem, this stem can grow to a height of four to seven inches and comes out a cone like spike - this spike contains spores of the plant. The initial stem does not last long and withers away. The second stem is a green and sterile structure reaching a length of eighteen inches in height and crowned by whorls of small branches - this is the final shape that the plant will take for its life span. 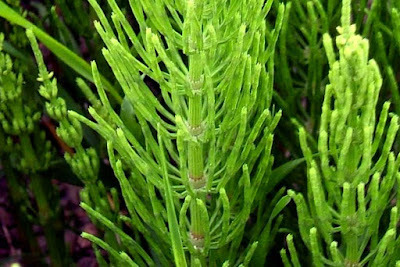 The silicon content of the horsetail is the highest in the entire plant empire, and no other herb comes even near to the silica levels found in the plant. Silica is an important trace element for the body; it helps in binding protein molecules together in tissues such as the blood vessels and other connective tissues in the human body. Collagen, an important constituent of the tissues is largely made from silicon. The role of the collagen in the body is to act as the "body glue", enabling the skin and muscular tissues to stick together as an integrated whole. The growth and stability of the skeletal system in the body is also promoted by the mineral silicon - the mineral is required in trace amounts in the diet. The properties of the horsetail have been measured in a few European clinical studies - where it was determined that broken and fractured bones tend to heal quicker if horsetail supplements were taken by the patients. When horsetail is added to the diet of patients, it also led to a reduction in the incidence of osteoporosis - thus, there is direct health benefits associated with the use of the horsetail. Some herbalist and folk healers suggest that athletes suffering from problems such as sprains and dislocated joints, and pulled hamstrings or torn ligament injuries could benefit from supplements of the horsetail herb in the diet. The herb also has other uses, and the horsetail herb can be seen as one of those rare and exceptional cosmetic agents - that work to beautify from the inside rather than just altering external appearances. The texture, strength and tone of hard tissues such as the hair, the nails and the skin is also greatly improved by horsetail, at the same time the herb is very good at greatly strengthening the bones and the teeth of people. A positive hidden "youth factor" present in the horsetail is also alluded by some individuals. The horsetail prefers damp soils for maximum growth and is a very common plant, horsetail is native to much of Europe, to North Africa and can also be seen in parts of northern Asia and the whole of the new world. Harvesting of the horsetail and especially the sterile stems occurs during the summer months and these are carefully dried in preparation for storage, during this process all the discolored parts are thrown away. Horsetail is also used for balding; tuberculosis; jaundice; hepatitis; brittle fingernails; joint diseases; gout; osteoarthritis; weak bones (osteoporosis); frostbite; weight loss; heavy menstrual periods; and uncontrolled bleeding (hemorrhage) of the nose, lung, or stomach. Traditionally used to stop bleeding in wounds, the horsetail herb is said to be an excellent clotting inducer. The herbal horsetail remedies have been used to staunch all kinds of wounds; it has been used to stops excessive nosebleeds, and also in bringing about a reduction in the coughing up of blood during different diseases. The urinogential system of the human body is also positively affected by the astringent effect of the horsetail herb; this property is especially valuable in those cases of bleeding occurring within the urinary tract of a person - including disease such as cystitis and urethritis in patients. The internal tissue damage in connective tissue is also repaired and corrected by the horsetail herbal remedies, which speeds up the rate of tissue repair, thereby promoting the strength and elasticity in the newly formed tissues. Symptoms caused by rheumatic and arthritic problems are also treated utilizing horsetail based remedies, the horsetail is also used in the treatment of various chest ailments like emphysema, it is used for the treatment of chronic swelling affecting the legs, and also in the treatment of various other conditions affecting people. Slow healing sprains and fractures can also be topically treated using a decoction of the horsetail herb added to bathwater. The horsetail herb has a long lineage and is a descendant of prehistoric plants; these ancient relatives of the herb were tall as trees. The horsetail is also known to be the richest plant source for the mineral silica aside from other useful and beneficial minerals. This makes the plant a very valuable herbal remedy for the treatment and healing of tissues as well as a useful and effective herbal nutritious tonic. The horsetail herb strongly affects the functioning of the urinary system in people, and endows a mild diuretic as well as soothing effect on the affected urinary tissues. It is also capable of healing all manners of irritation and infection affecting the urinary tract in general. Children affected by frequent urges to urinate, by bed wetting behaviors and incontinence for a long time can be treated using the horsetail as the astringent properties of the herb make it a very useful remedy to check such problems. Inflammation in various tissues of the body is frequently treated using the horsetail based remedies and the herb is also used in the treatment of problems like the benign and harmless enlargement of the prostate gland in patients. The herbal remedies made from the horsetail are also useful as general tonics for boosting the performance of the kidneys and the urinary system in people. The reproductive system is also beneficially affected by the horsetail herbal remedies; the herb is very effective at reducing hemorrhage and heavy bleeding in patients affected by such disorders. The horsetail is also effective in treating such disorders which affect the functioning of the digestive tract, it is capable of healing inflammation and ulcers in the stomach, and similar problems affecting the respiratory tract - traditionally the horsetail was the remedy used for treating TB and coughing of blood streaked sputum. Lusterless hair and brittle nails can also be treated using the herbal horsetail remedy, and the herb is also useful for treating debility and anemia in patients. 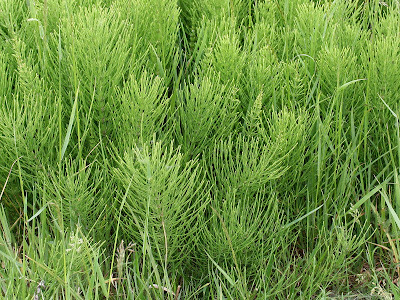 Horsetail has a lot of silica, which actively aids in the rapid absorption of calcium from the food, and this action of the herb so helps guard the body against the danger of osteoporosis and muscular cramps, and for this reason horsetail can greatly help in the prevention of atherosclerosis in patients. Irritated skin and skin conditions like eczema can be topically treated using a herbal horsetail lotion, this can also be used to heal all manners of cuts and wounds, it can be applied to alleviate sores and ulcers, and it can also be applied to areas of skin affected by chilblains and related problems. Horsetail based mouthwash and gargle can also be used for the treatment of problems such as mouth ulcers, it can be used to stanch bleeding gums and in the treatment of sore throats and other oral problems. 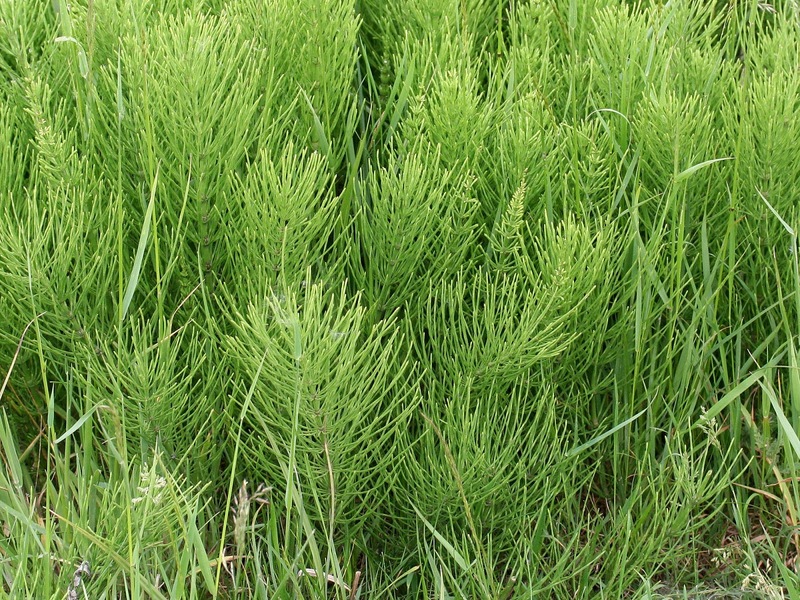 There have been reports of horsetail products being contaminated with a related plant called Equisetum palustre. This plant contains chemicals that can poison cattle, but toxicity in people has not been proven. Horsetail is possibly unsafe when taken by mouth long-term. Horsetail contains a chemical called thiaminase, which breaks down the vitamin thiamine. In theory, this effect could lead to thiamine deficiency. Some products are labeled "thiaminase-free," but there is not enough information available to know if these products are safe. Pregnancy and breast-feeding: There is not enough reliable information about the safety of taking horsetail if you are pregnant or breast-feeding. Stay on the safe side and avoid use. Alcoholism: People who are alcoholics are generally also thiamine deficient. Taking horsetail might make thiamine deficiency worse. 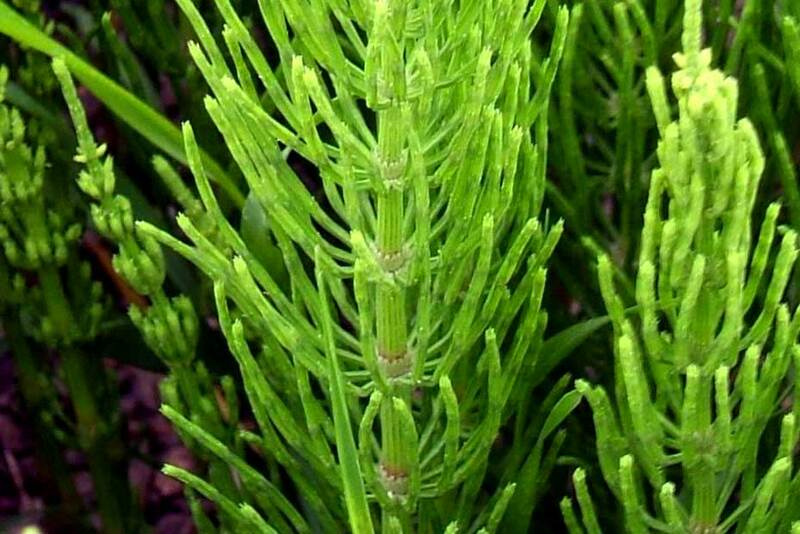 Diabetes: Horsetail might lower blood sugar levels in people with diabetes. Watch for signs of low blood sugar (hypoglycemia) and monitor your blood sugar carefully if you have diabetes and use horsetail. Low potassium levels (hypokalemia): Horsetail might flush potassium out of the body, possibly leading to potassium levels that are too low. Until more is known, use horsetail with caution if you are at risk for potassium deficiency. 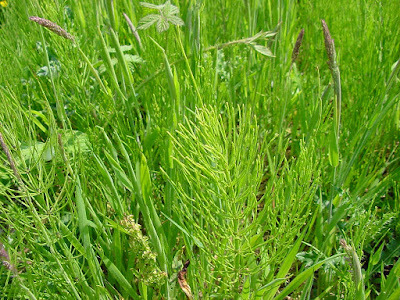 Low thiamine levels (thiamine deficiency): There is a concern that horsetail could make thiamine deficiency worse.